The Japanese monkey, Macaca Fuscata, had been observed in the wild for a period of over 30 years. 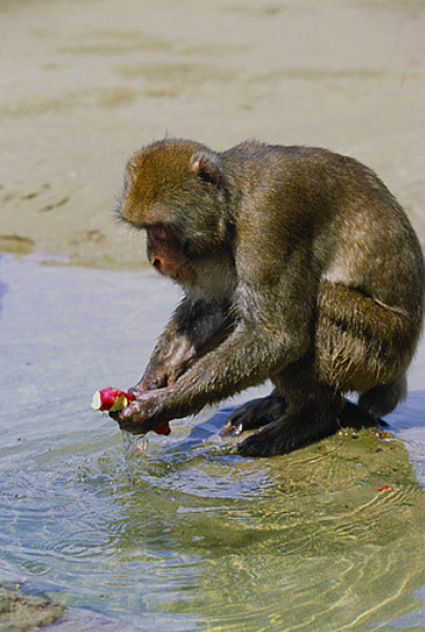 In 1952, on the island of Koshima, scientists were providing monkeys with sweet potatoes dropped in the sand. The monkey liked the taste of the raw sweet potatoes, but they found the dirt unpleasant, so they ignored the potatoes and ate other vegetables. An 18-month-old female named Imo discovered she could solve the problem by washing the potatoes in a nearby stream. She taught this trick to her mother. Her playmates also learned this new way and they taught their mothers too. This cultural innovation was gradually picked up by various monkeys before the eyes of the scientists. Between 1952 and 1958 all the young monkeys learned to wash the sandy sweet potatoes to make them more palatable. Only the parents who imitated their children learned this social improvement. Other adults kept eating the dirty sweet potatoes and paid no attention to what the other monkeys were doing. Then something startling took place. In the autumn of 1958, a certain number of Koshima monkeys were washing sweet potatoes — the exact number is not known. Let us suppose that when the sun rose one morning there were 99 monkeys on Koshima Island who had learned to wash their sweet potatoes. Let’s further suppose that later that morning, the hundredth monkey learned to wash potatoes. Then an extraordinary event occurred. By that evening almost everyone in the tribe was washing sweet potatoes before eating them. The added energy of this hundredth monkey somehow created an ideological breakthrough. But wait, something even more surprising happened. The scientists discovered that the behavior of washing the sweet potatoes then jumped over the sea. Colonies of monkeys on other islands and the mainland troop of monkeys at Takasakiyama began washing their sweet potatoes. All the monkeys everywhere suddenly realized how to make the potatoes palatable by washing them. Incredibly, it seems, when a certain critical number achieves an awareness, this new awareness may be communicated from mind to mind. Although the exact number may vary, this Hundredth Monkey Phenomenon means that when only a limited number of people know of a new way, it may remain the conscious property of these people. But there is a point at which if only one more person tunes-in to a new awareness, a field is strengthened so that this awareness is picked up by almost everyone. This seems to confirm the concept of Carl Jung’s collective unconscious, and the parallel stories from biologists’ morphogenetic fields. Archetypes, patterns, or fields that are themselves without mass or energy, could shape the individual manifestations of mass and energy. The more widespread these fields are, the greater their influence on the physical level of reality. Is it too much of an imaginative strain to interpret significant events in history as the result of spontaneous transmission of ideas? Could this, for example, explain the fall of the Roman Empire when its citizens became rampantly corrupt? Karl Marx’s overthrow of the Czar when the Russians lost faith in the integrity of their government? The rise of Adolph Hitler when the Germans lost their belief in democratic reforms? The defeatism exhibited by the French in WWII because of their losses suffered in WWI? Is this what happened during the Viet Nam war? In the beginning of the war there was almost universal support for the war, but over time opposition to the war grew to the point when suddenly the population almost spontaneously began to demand an end to the war. Since the 1960’s, I’ve observed a predominance of liberalism in the universities and, consequently a growing dominance of liberalism in government, education, media, religion, community organizers, law and labor. Is it possible that the universities have spawned the spontaneous transmission of liberalism that is transforming America from free enterprise and personal responsibility into the passive acceptance of big government controlling every aspect of our lives? Has the population reached the tipping point? What Is Your Story About Creative Thinking and Innovation? Hmm, I love your articles. I see them as having relevance for many aspects of life. In fact, I plan to use some of them as metaphors or stories in my coaching practice. So, I’m disappointed when I see the last para of your article above as equating what you call liberalism with lack of personal responsibility. I see rather an important principle of people supporting one another in ways that make all stronger, more willing to invent and more secure. Too many take the path of least resistance. It’s hard work to have to think for yourself.